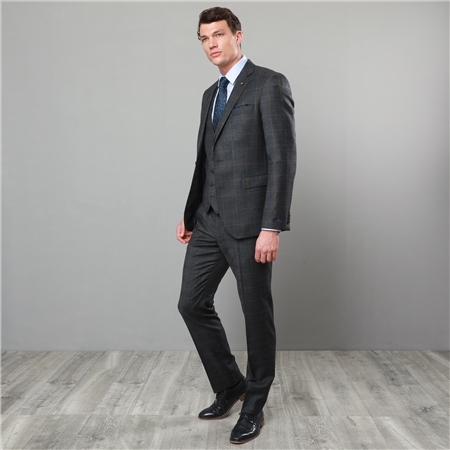 A contemporary charcoal suit with subtle blue and grey overcheck design. Style with a Blue Formal Tailored Double Cuff Shirt and a matching silk tie and pocket square to complete the look. Jacket - Two-button closure, side vents, outer breast welt, double jetted straight flap pockets, wolfhound lapel pin, and lapel buttonhole. Trouser - Plain front trouser, belt loops, hip pockets and zip fly. The fit is true to scale. Jacket centre back - 74.5cm on a size 40R.